Kirby’s Adventure for the NES was the game that introduced copy abilities, a series staple. 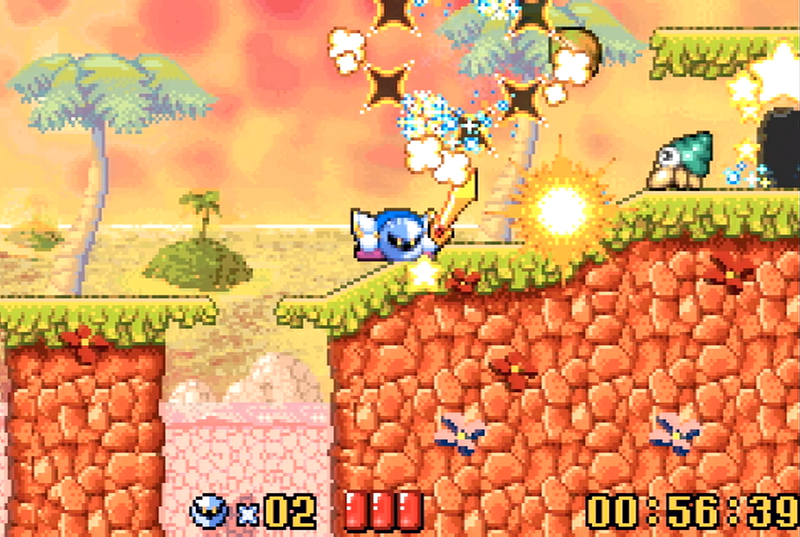 It’s easily one of the best games on the system and was remade for Game Boy Advance and titled Kirby: Nightmare in Dream Land, release in October, 2002. Nightmare in Dream Land includes improved visuals and it added multiplayer support. For this review, Jeremy and I teamed up to play it using two GameCubes with Game Boy Players and homebrew software called Game Boy interface. The story is set in Dream Land where the Fountain of Dreams collects the hopes and dreams of all living things. One day everybody lost the ability to dream because King DeDeDe took the star rod which powers the fountain and broke it into pieces. 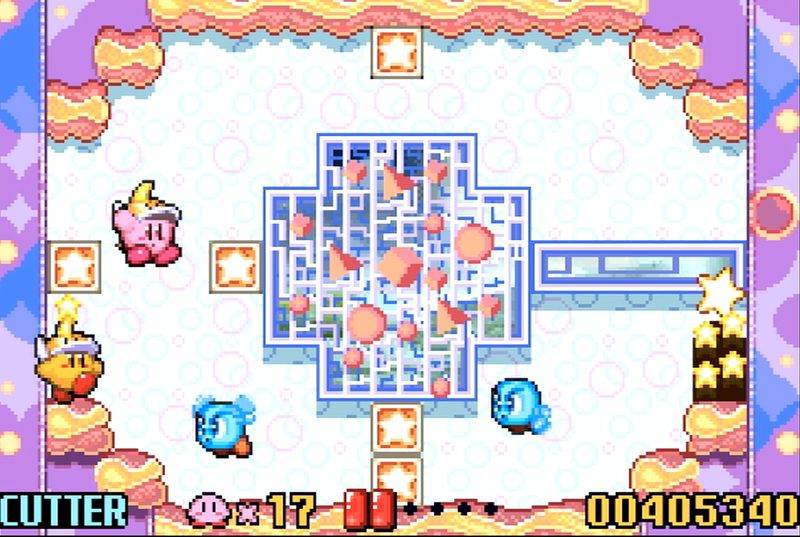 Kirby sets out on an adventure to retrieve the star rod pieces and restore peace. 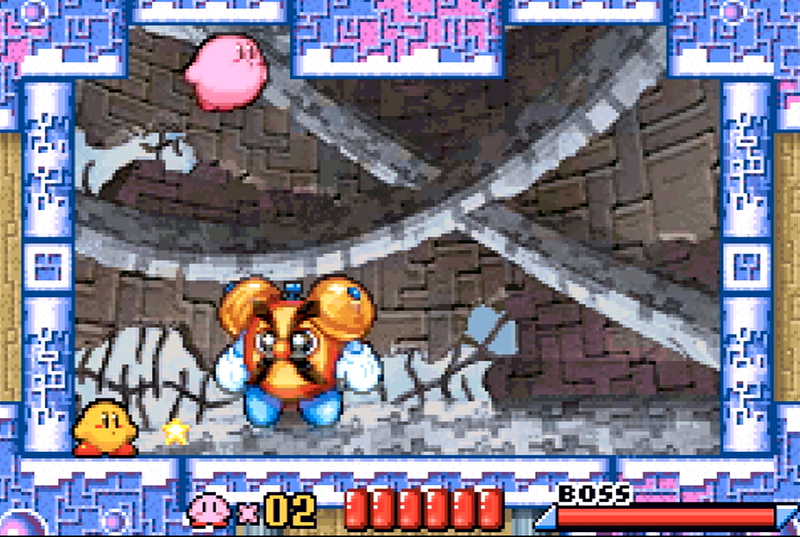 The game does support up to four players and no matter which player you are, you play as Kirby. Kirby can walk, run, jump, fly, inhale, slide, and duck. When you take hits you lose health and you can restore your health by drinking pep brew and eating Maxim Tomatoes, both of which are found throughout the stages. After restoring health, you can perform a face-to-face with another player to restore some of their health, too. If a player a dies, they will respawn when the others get to the next area. As expected, Kirby can inhale enemies and certain ones will grant him special abilities, some of which are required to complete specific puzzles. And unlike future games, the abilities aren’t always near the puzzles. If you manage to beat the story, you’ll unlock the Boss Endurance mode, and if you complete the story to one hundred percent, you’ll unlock the Extra mode where you can play through the game again with half of your vitality. If you beat Extra Mode to one hundred percent, you’ll unlock Meta Knightmare mode where you get to play as Meta Knight. He only has three hit points and he’s basically the sword ability with more moves. The story contains multiple levels which are basically worlds. 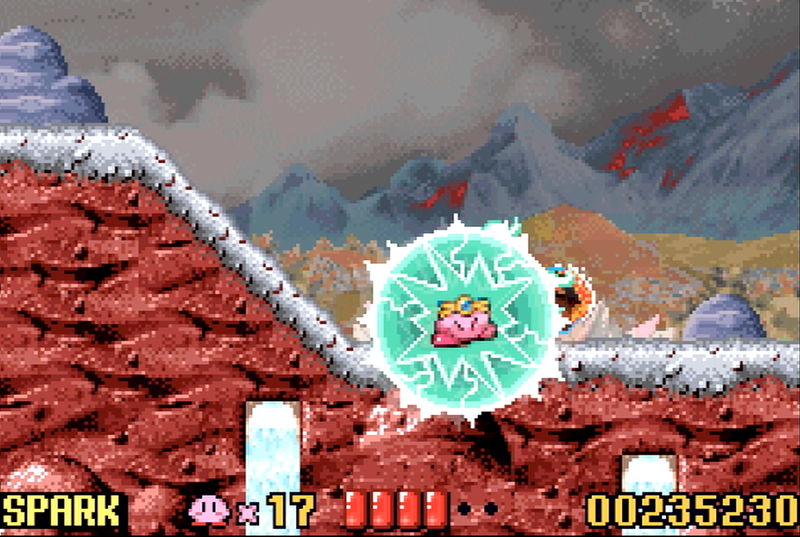 Each level contains numerous stages, a boss, and sub-games. Nightmare is a remake of Kirby’s Adventure which is the successor to Kirby’s Dream Land and this is yet another short game. You can beat Nightmare in a few hours. Meta Knightmare mode will actually time you and it took us about an hour and a half to beat. You need to beat one stage to advance to the next and if you manage to find the hidden switches in the stages, you’ll unlock sub-games, warp stars that take you to the other levels, and museums which contain abilities. To complete the game to one hundred percent, you need to find all the switches. There’s four sub-games to play and they can reward you with lives. Bomb Rally has players smacking bombs to each other. Quick Draw plays out in rounds. Whoever presses the button first when prompted, wins the round. In Air Grind, you’re racing by grinding on rails. And the Arenas is where you’ll fight minibosses. When playing cooperatively, you can only go so far on your own. You do need to stay together for the most part. If you’re too far apart you won’t be able to go through a door until everybody is in the vicinity. On your quest to retrieve the star rod pieces, you’ll come across all sorts of enemies that can grant you abilities. You can burn enemies with fire, bounce around as a ball, use the cutter ability to throw blades at enemies, and freeze enemies with the ice ability. Kirby wears a different outfit based on the ability which is new to Nightmare. 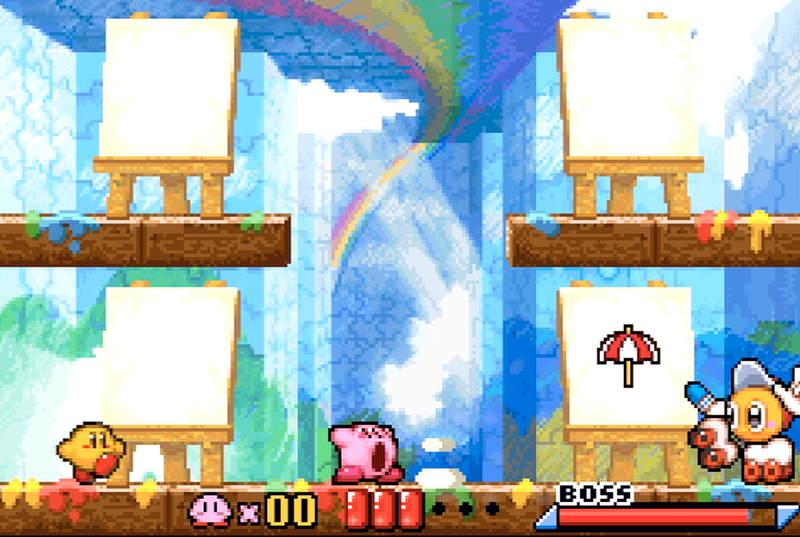 In Kirby’s Adventure, he would only change colors. The game can be somewhat unforgiving because one hit is all it takes to lose an ability. You can get it back by inhaling the star that comes flying out of Kirby. Some abilities like Crash and Mike can only be used a certain amount of times before they disappear but most can be used indefinitely. You can drop an ability at any time if you want to try a new one and many puzzles will require you to change abilities. Some puzzles are made easier if playing with friends but for the most, they’re not very difficult. At the end of every stage, you’ll have to participate in a minigame where you try to jump as high as you can and if you land on the highest platform, you’ll earn an extra life. The stages are all varied in theme and design. You’ll be jumping and flying over gaps, you’ll swim underwater, wind will push you around, you’ll have to light up dark areas, warp stars will take you to new areas of a stage, and you should always be on the lookout for secret doors. Enemies will be walking around, some fly, and most of them aren’t very difficult to defeat. Every now and then you’ll come across minibosses which take several hits to bring down as do the regular bosses which are encountered at the end of each level or world. If you want a real challenge, the Boss Endurance mode will pit you against every boss. You’re provided no abilities to start, one life, and it will require memorization of their attacks and patterns. Visually, Nightmare looks much better than Kirby’s Adventure. The colors are vibrant, the sprites look great and are well animated, and the backgrounds are well detailed with the exception of one stage which had a noticeably glitchy background but that may have been due to how we were playing. The sound effects are what you would expect but the pops of defeated enemies and explosions do sound satisfying. The music is upbeat and catchy and contains some truly memorable tunes. When it comes to the technical side, we experienced some serious frame rate dips. Especially when playing the Air Grind sub-game. This, too, may have been due to how we were playing. We also experienced some noticeable button lag. Despite some of the technical issues which may or may not be a problem on the Game Boy Advance, we did have fun with Kirby: Nightmare in Dream Land. It’s a bit on the short side but so are several other Kirby games. This and even Kirby’s Adventure are quite dated now but they hold up well enough. You can tell from the get-go that the basic mechanics here have been carried over into most of the future games because it’s still fun. Nightmare is easy to pick up and play, it’s accessible, and there’s definitely some challenge to it. The final two levels are probably the most difficult levels in the story and the Boss Endurance mode will really put your skills to the test. Kirby: Nightmare in Dream Land is definitely the definitive version of Kirby’s Adventure and we would recommend it. It looks a lot better and you can play it on-the-go. We do believe the technical issues are due to our setup but they weren’t enough to stop us from enjoying the experience. If you’ve played newer games in the series, Nightmare may feel a bit dated in some respects but you should still feel right at home as soon as you start playing. Definitely check it out if you haven’t already.